Gazal, pronounced Giselle, is a local eyewear designer located in Roswell & Atlanta. 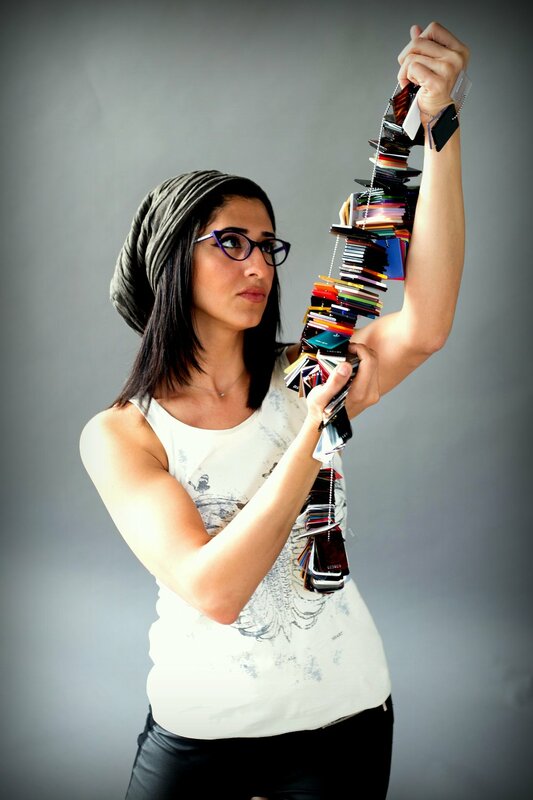 Gazal has been an eyewear designer for over decade, but has had a strong interest in eyes ever since she was a child. Still to this day you can catch her doodling eyes, new frames, and contact lenses just for fun! She has over 20 years of experience in the eye care industry doing just about everything from assisting patients with glasses and contacts, running her own practice, to working on set with big film productions. Gazal is a licensed Optician in Georiga holding her ABO, NCLE and state license. She obtained her Opticianary degree at Georgia Piedmont College and graduated with honors. Shortly after obtaining her degree she opened her first luxury eye care boutique in 2008, Atlanta Vision Optical. Gazal is also a Film Lens Tech & Eyewear Designer for many of the major film and television shows that are made right here in Georgia. She has worked alongside some of the biggest actors as their personal lens technician including Jason Mimoa, Norman Reedus, Jon Bernthal, John Malcovich, Michael Douglas, and many more. She has worked on many films such as Ant-Man, Guardians of the Galaxy 2, The Walking Dead, & Spiderman. How is Gazal Eyewear Different than any other eyewear line? A good product sells itself with little influence from the Optician/salesperson. Gazal realized early on that details and quality are important aspects to look for when choosing who to work with and when shopping for any item, including glasses. "Why would you ever put anything on your face that wasn't made well and looks great?" The eyewear products truly speak for themselves. Each frame is carefully hand crafted using lightweight & durable titanium material so that you have the most comfortable and long lasting glasses possible. The medical grade Japanese titanium metals are also the most durable in the world so that you will have a product that will last a lifetime. "Not all titanium metals are equal." The frame life is also very dependent on the hinge design and materials. The hinge is usually the first part that breaks on a pair of glasses because it is constantly being stressed, opened, and closed. Because so much stress is on the hinge Gazal has spent years on choosing the best materials and designs. Even the type of screws used in the hinge is carefully selected so that you have a long lasting design. "I just won't wear the glasses if they are uncomfortable." Sleekness and fit is important to everyone who wears Gazal Eyewear. This is why so much time is taken to make sure each measurement and each curve of the frame serves a purpose while maintaining a beautiful aesthetic. Careful attention to the bridge (the part of the glasses that rests on your nose), temple tip ergonomics, and weight distribution are analyzed with each frame design to ensure proper fit and comfort. What makes Gazal Eyecare so special? Gazal Eye Care was created by Gazal Tabrizipour and her husband Saeed. The mission is to introduce unique high quality eyewear designs to the local community where all the magic started. The couple originally met in Roswell, Georgia and they are excited to bring the Gazal headquarters back Roswell Georgia. The boutique features all of her designs that all start from pencil and paper. She carefully sketches each frame keeping in mind the comfort, look, and maintaining optical clarity. Stop by our boutique anytime to see what's new and for your eye care services. There is always something new to try on with each visit! Since the beginning she has been eagerly waiting to share her eyewear designs with the world. In 2014 the Gazal Eyewear brand launched and has welcomed by the local community. Since then the brand has been featured in several motion pictures as well as honored for several design awards. Each year Gazal works diligently to create eyewear with LOVE. To bring a fashionable, comfortable, and long lasting piece of art that everyone can enjoy. The first season of Teen Wolf Gazal works as a contact lens technician. Each actor/actress is given full attention and care while wearing full cosmetic contact lenses. Each set of lenses are hand painted and are truly works of art. The lenses can really bring a character to life. Gazal loves design and the optical field gives her an opportunity to create not only amazing eyewear designs but custom made contact lenses. The lenses seen here are called "Time of Death" a carefully hand painted scleral lens that looks like the face of a clock.